Ready the Bat-Signal, Seattle: You are officially the most dangerous city in America when it comes to cybercrime. According to the folks at Symantec, anyway. 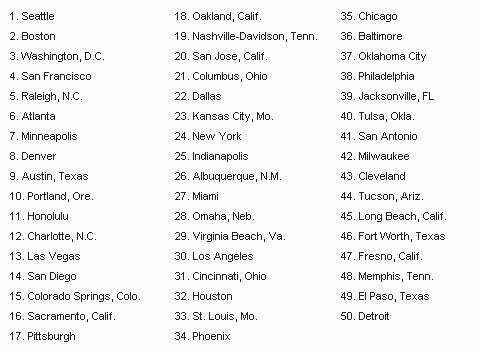 Symantec -- the security company behind the Norton line of virus-protection products -- has just released its list of the 50 American cities most vulnerable to cyberattacks. And it turns out being close to Bill Gates isn't enough to keep Seattle out of the number 1 spot. Symantec's "Riskiest Online Cities" report ranks Seattle at the top, followed by Boston, Washington, D.C., San Francisco, and Raleigh. Atlanta, Minneapolis, Denver, Austin, and Portland round out Symantec's top 10 riskiest locations. Before you start packing your bags, though, let's take a closer look at Symantec's study. (Click on image to the right to enlarge.) The gang's cybercrime rankings don't actually mean you're doomed to become a victim just by living in a risky city; they simply suggest that the conditions in your hometown might make it easier for a cybercrook to do his dirty work. Think of it as a friendly reminder to step up your security game. Specifically, Symantec says its report combines internal data on cyberattacks and malware infections with third-party data on online behavior. The more high-risk activities observed in each state -- things like use of public Wi-Fi, online shopping sites, and online banking services -- the more "risky" points it received. All those factors were ultimately added together to figure out which places were the worst. See? Making the list isn't so bad. It's kind of like ranking on one of those Men's Health surveys: Even if you're in "America's fattest city," you can still make the decision to skip the corn dog and hit the gym. Gyms may not help much in this scenario, but a little common security sense can go a long way. Avoid paying bills or sending other sensitive information when connected to a public hotspot. Configure your Wi-Fi device prior to connecting to ensure that sharing isn't enabled. Keep a firewall enabled at all times. And make sure your PC isn't set to connect to any open network; instead, manually connect only to networks you know and trust. Either that, or just get Batman on your side. Gotham didn't make the list, so odds are, he's available. You can view the full list of Symantec's 50 riskiest cities for cybercrime here.